Hear that? That's the Tiki Island Slide calling you. This water slide has the magic power of compelling those who see it to climb to its peak and take the plunge into its depths. And on a hot summer day, that is one compulsion you'll be glad you acted upon. 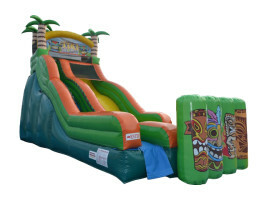 Don't deny the ancient forces; order the Tiki Island Slide for your next party.